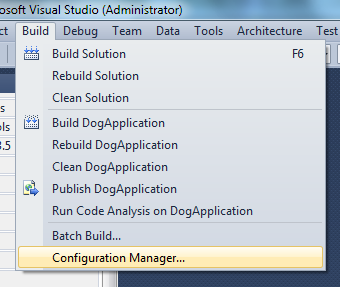 In Visual Studio, a build configuration represents a set of saved properties that affect the build process. A build configuration can be associated with a solution or with individual projects. A build configuration at the solution level dictates which projects to build for that configuration, which build configurations to use for individual projects, and which platform to build each project for. 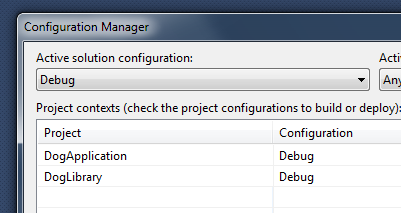 At the project level, a build configuration allows setting different project properties for each configuration. For example, a “Debug” configuration might be configured to define the DEBUG constant and generate full symbols for debugging purposes. You select the current build configuration to use by selecting an item from the Solution Configurations dropdown in the main toolbar. You can also select Configuration Manager from the Build menu and then change the configuration in the Active solution configuration dropdown.